Since the advent of Napster and the rise of free news on the internet, two of the 20th century’s biggest industry giants are finding it increasingly difficult to survive. How do you encourage people to buy newspapers and music? The Guardian have come up with a novel way to kill two birds with one stone. 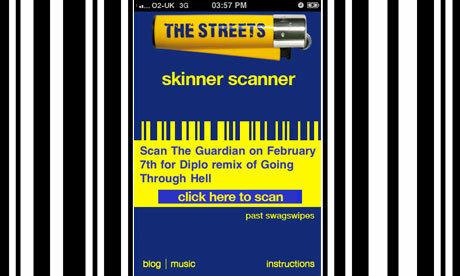 Pairing up with Mike Skinner from The Streets, they’ve developed Skinner Scanner an iPhone app which is essentially a branded QR reader. Once downloaded, readers of The Guardian are encouraged to scan a QR code on the front of each copy of the newspaper this week. The app will then grant them access to exclusive tracks and remixes of songs from the fifth release by Mr. Skinner, Computers and Blues. If this preview isn’t enough to persuade you to buy the new album, you can always stream it for free via Soul Culture. This entry was posted in Innovation, Music. Bookmark the permalink.